As per legends, Sree Durga Bhagavathy Temple, Thaikkattussery is second of the 108 goddess Durga temples solemnly installed by sage Parasurama. Lord Dhanwantari, the terminator of all ailments is meditated behind installation of the idol here. At the same time, the worship is based on rituals observed in the case of goddess Durga. Hence a temple of this genre is the rarest in kerala. “Devi” is the “kuladevatha” for Thaikkattu Moss’ family. 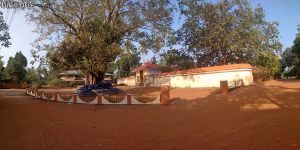 The temple is near vaidyaratnam nursing home. Durga Dhanwanthary pooja and Dhanwanthary pushpanjali are the main offerings of the temple. The dress code is highly formal, you can’t enter the inner sanctum while wearing pants. You should be wearing dhoti or mundu. You can reach this temple from Thrissur via Ollur. There are some buses from Thrissur which you can board from Sakthan stand. Please check out other temples listed on this site.